I had asked for help for animal communication for my dog. I ordered a pyschic vision kit and candle which has not arrived yet and I got terrific ideas from lots of you I am going to try. But a new and more URGENT situation arose. My dog has been sick since we came home from the dog park. There are a few things that it could be and if he is not any better or worse I will go to the vet this afternoon but in the mean time does any body have just a verbal prayer to say to help with the animal communication that i can do asap so i do not have to do much physical stuff? I have many things at home so i can light a candle while i am saying verbal prayer or something. Is there anyone out there who does distance animal channeling who can ask my dog about his condition? Please if anyone out there can help i would greatly appreciate it. i will be checking this periodically. hope to hear from you guys sharon (and my dog brody) maybe there is an empath or a person who talks to animals that could help. St. Francis was said to preach to animals and talk to them so hes a good one to petition if your comfortable with working with saints. Also if you need fast results theirs Saint Expedite. You can find more info on him here: http://www.luckymojo.com/saintexpedite.html Hes great for fast results but you must remember to make an offering, usualy of flowers, if he comes through fore you. That's true of most saints but I have heard that Saint Expedite will take back what he has done for you just as quickly he gave it to you if you don't make your to give him something back. I hope your pup is OK.
Hail Discordia gave you some great advice, the only thing I would add is that in times when you are stressed and upset, I find it helpful to light a small light, it can even be a brithday candle, focus on it for a few seconds, take some deep breaths, maybe say a prayer and then get back to what you are doing. I agree with the above choice of St. Francis. Apart from that, most spells designed for humans work on dogs, cats, horses and other domesticated animals. Those spells designed for love and sweetening especially. Like carrying a piece of apple in your armpit for a few hours, then feeding it to your dog or feeding it with other personals to tie it closer to you. Strengthening the bond usually leads to a better and stronger ability to pick up its mood, feelings and alike. Take the dog to the vet. As for the waxing and waning moon - I would do both, starting with the one you can do soonist. While some hoodoo spells call for timing spells by the moon, you can also do the work by the week. Blessing work on Sunday is appropriate. Thanks good idea to do both, In case anyone works with wicca Fri the 13th is the day to work with Norse goddess Freya I mention this because she will help you with luck in your spells today if you burn a pink candle and pray for her help. My dog just injured both paws,went to vet got meds nad he has to rest but Is there any spell or prayer I can do tonight to help(he is getting no better)I have candles,healing oil,many seals,incense,other oils,herbs,loadstone,magnetic sand. I would like to start something tonight(which color candle for healing) The other thing is have you ever heard of any healing modality working overnight or starting to work over night? Hi,first going to the vet was good and follow their advice to the letter. Second: the meds the vet gave you won't work miracles, you have to give it time for the treatment to have effect. Calm down the dog will be fine. As for dealing with this from a magic perspective I would say a prayer. I would not use any oils or powders on the animal, at least not wear it could possibly lick it. You can light a white candle for healing. As for something like that working over night, well anything is possible but a physical injury isn't in all probability going to heal over night. Don't rush things, the animal needs time to recover. So yeah, I would light a white candle dressed with healing oil and pray from the heart, if you want to ask a saint to intercede on your behalf the Saint Francis is the patron of animals. Okay, first the details. I've been doing magic stuff for over ten years and doing hoodoo for about half that time. So, I'm not a beginner but not an expert either. Here's the deal: one of my dogs is hurt (and will be going to the vet tomorrow if I can get him in). I'm wanting to do some magic to help him heal. We think he tried to jump the fence when ice was covering the ground and had a bad fall. He's dragging his back left leg and his ribs are very sore, but not swollen as far as I can see. He eats and drinks some and goes potty once or twice a day and is breathing okay and his eyes are alert. But mostly he just lays still and tries to sleep. But I can tell he's in pain cuz he yelps very occasionally (mostly when I try to pick him up) and walks very, very slowly. So, I want to do some magic to help him heal. The problem is I'm kind of a nervous wreck about it. I'm really worried about him and my mind is all over the place. So I'm thinking that it might not be a good idea for me to work a spell since I'm really scatterbrained right now. Can anyone recommend something I could do that's simple and maybe doesn't require serious concentration? I'm doing the typical things for him, keeping him as still and quiet as possible and keeping the heating pad on him and carefully carrying him when necessary and just making sure he takes it easy. But he's hurting and it's killing me. I want to do all I can to help and that includes magical assistance so I could really use some advice. Any input or support would be greatly appreciated, thanks. A simple white candle, with healing oil if you have it, should do the trick. Not complicated, not requiring a lot of preparation or detailed work. Just write a petition for your dog to be well, place it under the candle, concentrate for five minites or so and leave it burning somewhere safe, preferably in the same room as your dog but not where it can be knocked over. Lay your hands on the areas that are sore - or if they are too sore, then just lay them on the dog's body anywhere he will let you. Imagine a sphere of White Light/Christ Light/ Universal Light (what ever you want to call it) about a foot above your head, then see a beam of light shoot down from that sphere down into your body, down your spinal column. When you inhale, imagine the healing Light flooding into you from the Universal Source, when you exhale, imagine that the Light travels down through you and out your hands. Just take calm steady breaths that are easy for you to maintain. You may very well feel your hands grow very warm and perhaps tingly. You can pray while you do this, praying for the recovery of the dog. You can even breathe your prayers into the dog using this same visualization. If you are comfortable with St. Francis of Assisi, you may wish to petition his aid. Lighting a nice candle that you've prayed over and dressed with Healing or St. Francis oil is a nice way to do this. You could also ask St. Francis to bring healing energy through you, and then use the visualization and breathing above. Thank so much for your input, I truly appreciate it. I guess I wasn't as scatterbrained as I thought as I have been doing some of these things without having read through your great replies. But I will keep at it and follow your advice. My boy is doing better. He still doesn't have full control over his back legs but he's mobile and seems to be over most of the pain. Thanks again for letting me ramble on in my panicky state. What did the vet say? They said it could be a spinal injury, possible nerve damage and would require an exam and xray for $65. Then possible cortizone shots for 2-4 weeks at $10 a pop. But in the meantime they said I could give him one low dose aspirin per day which I did for a while. I was starting to put money aside for the visit, as they don't take payments, when he started getting off the bed on his own. And he just kept improving after that. He's now almost totally back to normal. When he goes to hike he can't quite lift his leg as high as he wants and he sometimes walks with a little diagonal motion, and he can't get up to his regular speediness yet but the pain seems to be totally gone. *knock wood* Anyway, looks like I don't have to take him to the vet after all, thanks the gods! My kitty is ill,and I need some help! I Know St. Francis is th patron saint of all animals and probably would help in my situation,but St. Gertrude of Nivellles is the patron saint of cats. Has anyone petitioned her for help with sick kitties? If i wanted LM to fix a candle for me in her honor how would I order it? What would I specify? How would I go about repaying St. Francis or St. Gertrude? I am open to any other suggestions! Re: My kitty is ill,and I need some help! I am not familiar with Saint Gertrude and don't think Lucky Mojo sells this particular Saint's items. You can certainly call the shop and inquire. Lucky Mojo sells both Saint Francis of Assisi and St. Martin de Porres candles, religious cards, statues, bath crystals, incenses, etc... I have petitioned both Saint Francis and St. Martin with much success. For sick animals, I would petition St. Martin because he sheltered and healed stray dogs and cats and could speak with animals. You could just have a candle dressed with All Saints oil, Holy oil, or Healing oil for that case. To repay Saint Francis, you may contribute to shelters for wildlife (he is primarily the saint of wild animals). To repay Saint Martin de Porres, you would contribute to any sort of veterinary program for domestic cats and dogs, such as a regional non-profit organization that provides free or low-cast spay and neuter services to low-income pet owmers. In my area, for instance, i give to Forgotten Felines of Sonoma County. There are others in other parts of the country, like Alley Cat Allies, Animal Birth Control, Metro Cat Action Team, North Shore Animal League, Feral Cat Coalition, and many, many more. Use a google search on the term "low cost spay neuter" and then search by state for the one nearest your home.They are all in need of donations, and would gladly accept whatever yopu can give in honour of Saint Martin de Porres. I also would recommend petitioning St. Martin de Porres. During his time on earth, he showed compassion toward stray dogs and cats by starting an animal shelter at his sister's home. Hi All, last December I had to put my 12.5 year old Doberman down. It was extremely painful and broke my heart.. but she had a long life and her heart was just giving out. A week later, I rescued an 11 year old Doberman (in great shape) whose owner had died. She made the holidays and the new year and football season a hoot. On Tuesday, she was in the yard running and collapsed dead. Also, her heart. Dobes are predisposed to heart issues and I knew when I adopted an 11 year old we wouldn't have much time; but losing two dogs in 8 weeks has been hard. Next week I am taking in a 6.5 year old former breeder Doberman and looking forward to it. I have never used any oil and/or candle to pray for the protection of a pet - if anyone has any suggsetions or ideas it would be greatly appreciated. Obviously, any of us can die at any time and there are no guarantees, but if there is something I can do to protect this one from the classic heart conditions in Dobes, I would do it. Thanks much and best wishes to everyone. If you work with saints at all, St. Francis -- patron of animals -- is an obvious choice here. 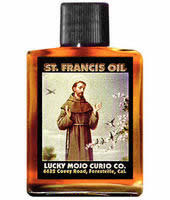 Burn candles on a picture of your new dog; spike his grooming products with St. Francis oil or Blessing or 7-11 Holy oil (the last one has a strong, spicy fragrance; he might shy away from it). You could also place a protective charm such as one of those little blue glass eyes on his collar. And then there's this simple Canine Healing Spell that was posted in May last year. St. Martin de Porres is the patron of veterinarians and stray cats and dogs. He started an animal shelter and could talk to animals. Lucky Mojo carries several products to assist in petitioning him. He is also the patron of the poor, housekeepers, and those who are victims of discrimination, as well as those who are working toward harmony among diverse groups of people. Thank you all so much. I will be sure and take these tips and utilize them for my new girl. CAN-GLC-SMTP). The pages have not be developed yet but each are located on the appropriate pages. I have both oils for my little precious. I want to applaud you for adopting a little precious. I did a search and didn't find much in the forums, so I thought I'd ask. My mom and I run a dog rescue and we take in west highland terriers from all over North and South Carolina. Our most recent is a female currently named Skye. She has a pretty bad skin infection that doesn't seem to be clearing up very quickly with antibiotics. Are there any healing spells or rituals I could try that might speed things up with the antibiotics? Or perhaps help to heal her outright? I looked here also: http://www.luckymojo.com/blessing.html Should I just maybe try the white candle magic spell? Poor little baby... I am by no means a veterinarian, but regular readers are familiar with my passion about animals. Yes you can, and certainly consider petitioning St. Martin de Porres, he sheltered and healed dogs and cats and could talk to animals. My best friend's cat was rather sick a while ago--it was life-threatening--and we petitioned St Francis of Assisi, the patron saint of animals. The cat recovered significantly after that. Both of those saints are excellent to call on for animals. You may want to do a yes/no divination to see which one would be most appropriate for this case -- or work with both. Thanks for the replies! I think I will try and petition the saints. My cat had a tooth pulled and his gums swelled up and he had medicine to make the swelling go down they said wait a week its been a week they said its possible he might have cancer, his one side of his face is swelled up which forces his eye to close a little bit and they just ran a biopsy to see if he has cancer or what it is, I won't know for a few days but if it is it would be terminal i'm guessing I would like to have a candle or two set at luckymojo altar asap and I am wandering which ones will help in this situation to wishfully cure or help him get better and come back with non cancerous results. I seriously need a miracle. he means everything to me.thank you. You can petition St. Francis &/or St. Martin de Porres for your cat as they are both patrons of animals. In fact, St. Martin de Porres actually opened a hospital for sick and injured animals when he was alive! And of course Healing works for animals as much as people. I already purchased vigils to be lit before I knew if it was infection or cancer and I just ordered a saint jude for the results I just found out, is there anything anyone can recommend me ordering or anything for him to heal,recover and have a second chance and live, I don't want to lose him he is everything to me he does not deserve this. I want to do anything I can to try and save him. Post a prayer at the Crystal Silence League (http://crystalsilenceleague.org/public/prayer_type.php). My prayers are with you, I understand as a pet lover and owner. I just did that thank you, any other suggestions are highly appreciated I will try anything I won't give up. thank you for all the prayers on crystal silence league please keep them coming! My 10 year old large breed dog is sick and the vet cannot pin down exactly what is wrong. We've ruled out major organ failure and cancer (which is GREAT!!) and have him on 3 antibiotics and 2 other meds to alleviate his symptoms, eliminate infections and hopefully heal him. Thank goodness my dog likes pills and LOVES his vet. He is a willing participant in that regard. Blood tests have not worsened but have not improved in the 5 days he's been on meds, which has the vet a little frustrated. He's at least stable, which has me relieved. I have a vigil to St. Francis burning at MISC with healing and protection oils. I also have a St. Francis medal on my angel's collar. I have been putting LM Healing oil on his temples and his collar and the Healing oil sits out beside his picture on a small altar. I would like to burn some candles at home, as well. I have LM Healing oil and have ordered LM St. Francis oil. While I am waiting for the St. Francis oil, should I light a white 4" candle with Healing oil or a brown 4" candle with Healing oil and further petition St. Francis? Or should I do both? Various 4" offertory candles are the only candles that I have on hand. I also have some Van Van oil coming with the St. Francis oil but don't know if that would be appropriate rather than to clear out my space. I did a full house cleaning with Chinese Wash last Friday, too. Thank you for reading. Any suggestions or prayers would be greatly appreciated. Thank you, St. Francis, for your protection. You can also petition St. Martin de Porres, who healed and sheltered dogs and cats, and could talk to animals. Many thanks, I will do. I have to say, my dog smells SO good ever since I started putting LM Healing oil on his head. His vet really doesn't want him to get wet or have a bath, so the scent of the oil has been a nice bonus. Some of my dog's bloodwork was heading in the right direction and some of it was not, as eveidenced by slight jaundice on Monday. We decided it best to do a surgical biopsy to get to the bottom of things and to formulate a proper treatment plan. He had the surgery yesterday and has a pretty big incision on his underside (5" - 6"). He is recovering nicely and is definitely a fighter. We are still waiting for the labs but the vet said the irregularities he found on his liver didn't look too angry, just irregular with relatively clean margins. He was able to keep his spleen, too. WHEW. All in all, he's been doing well, so far. He still smells great, thanks to the LM Healing oil on his temples. Thank you to everyone who has read this thread and to everyone who has said a little prayer for my dog, who is truly an angel, masquerading as a dog. Then again, aren't all dogs?? My cat is so sick! I am begging for any help you can give me with my sick kitty. I have taken him to the vet twice now, and he is still having difficulty breathing. He is the sweetest cat...does not have a mean bone in his body. He is very friendly with everybody and even though he has to live with 5 other cats, he does not hiss or bite...he is just a jolly soul. He has been suffering for two days now, and has been given shots, pills, xrays, etc. I am beside myself with worry! I know to pray to St. Francis of Assissi,but am wondering what else I can do to help this poor fellow. If anybody has any suggestions, I would be most grateful! Thank you! Re: My cat is so sick! You can also ask St. Martin de Porres for assistance. He healed and sheltered dogs and cats and could talk to animals. Thank you so much for your help! I prayed to St Martin and to St Francis, and Felix is getting better....I will have to order the anointing oils to have on hand ....I have 6 kitties that I love dearly!! Bless you! Just saw this thread. I am SO GLAD your precious mewie is better. I almost lost my little familiar back in June so I know how you must have felt. I prayed to Martin de Porres, Francis of Assisi and Gertrude of Nievelles (she is the patron saint of cats!) for help, as well as Michael the archangel. I can honestly say they performed a miracle, for which I am eternally grateful. After kitty recovered, I made a donation to the local cat rescue charity where I live and I still burn a novena candle to the saints as thanks for keeping my little ones safe. My boyfriend's 5 year old cat is very sick with an incredibly difficult to get rid of intestinal parasite. For the last 8 months I have seen this cat get progressively worse. With the cat being in pain each day, suffering from incontenent bowls and behavioral problems because he's (1.poorly trained) & angry that he's in pain. Each vet visit becomes more expensive, they have done nothing to ease his pain; only giving the cat Prozac to calm him down and "prescription food"(which is a Ponzi scheme in itself). This cat is hurting and in my view, as in many of my pet loving friends view, this cat needs to be euthanized to end his suffering. The problem is my boyfriend (who has very little pet experience) thinks that putting the cat down means giving up on him and won't do it. How can I get him to see the error in prolonging this cats suffering? Yes, I agree with you. I am a HUGE animal lover but draw the line at them suffering. And, sometimes, people see the human emotional investment in their pets and try to drain them out of money. So, I suggest you influence him to your way of thinking with some influence spells. Try this webpage: www.luckymojo.com/influence.html. Good luck to you. I am rooting for you to let your boyfriend see the light! My apologies for previously posting medical info that was against LM's rules! While I understand what you're asking, I personally think 5 years is too young for a cat or any pet to go. You may want to consider talking to different vets as the one you're going to sounds like he's/she's at a loss of what to do. You don't even have to go to them -- many vets or their informed assistants will answer your questions over the phone. Consider asking about alternative/home remedies on top of any other medication for the cat. In addition to what Miss Aida recommended, you may want to use LM Clarity and LM King Solomon's Wisdom products to have a clear view of what to do. You may also want to get an LM Healing Vigil candle for the cat and use Healing oil on the candle, or other candles as well ( not on the cat directly). Also smoke the home and the cat's personal spaces with Healing incense. Also consider placing a prayer request at the Crystal Silence League. Fertility help with older dog? Does anyone have any recommendations to help encourage a productive mating of an older male dog with a younger female? I've found a lot of information here on the forums for older HUMAN males, but didn't know if there was something else I could do, so I'm asking for help. He is quite a distance away, I'm waiting for the time to be right again (the first attempt was not successful), then we will make another "visit" for one more try. This would mean a lot to us--he's the last of our line of family dogs, even if we could manage one offspring, we would be over the moon. I've hesitated to ask, because it is probably an unusual question, & I've never posted a query here before. I hope I have done it right, & kept as brief as possible, but can add more info if it would help--I'm hoping to place an order with Lucky Mojo soon, if there is anything that I need. (I even know their signs--he's a Cancer, she's a Capricorn. <smile>).